If a football stadium is a kind of open air temple to human passion; a place where barriers come down and for 90 minutes everyman is united, then so too is the beach a kind of museum for students of human nature. In the latest issue of Great Ocean Quarterly there is an article about beach life in Rio de Janiero by Flip Shelton that really struck a chord with me. Every nation has its own coastal culture and on the beach an Aussie remains always an Aussie; in search of the bracing chill of the breaking water, the throwing of the reinvigorated body down on a towel and the squeak of sand between the toes. I don’t think I’ll ever get used to the rows of umbrellas and loungers on Italian beaches, the idea that people pay to go to the beach, then only to remain curiously removed from the physical joy of sand and salt. Don’t be mistaken, a day stretched out on a lounger with a good book isn’t bad once in a while, but it is with a mix of fascination and disdain that I view the whole beach establishment tradition. The spiaggia libera, the free beach, is where I feel most at home. Last Friday a teacher’s strike in Rome combined with a cobalt sky dragged the me and the tigers to the station, and onto a train bound for Santa Marinella; one of my favourite Lazio beaches, its early 19th C beachfront pavilions and changing rooms for me a little reminiscent of St Kilda. June is the best month for diving into the Tyrennian Sea; the water is till crispish and the hordes have yet to arrive. Even better on a weekday, especially given that Santa Marinella has a disgracefully small hanky sized patch of free beach right at the end of the long strip of the colored umbrellas of the paid beach. We find a square metro and towels are down, buckets are out, sandy panini are consumed and everyone has a fine time until the train ride home. Summer is here and the aroma of spaghetti alle vongole and big bowls of sautéed mussels is in the air. When I wrote my Marinara article for Great Ocean Quarterly I did some research into the sustainability of mussels and mussel eating habits around the world. The great news is that mussels are naturally sustainable in that they are farmed on lines and so do little or no damage to the sea floor. As natural plankton filters they don’t rely on fish food which maintains the natural environmental balance, even if the more pristine the environment the healthier the mussels. 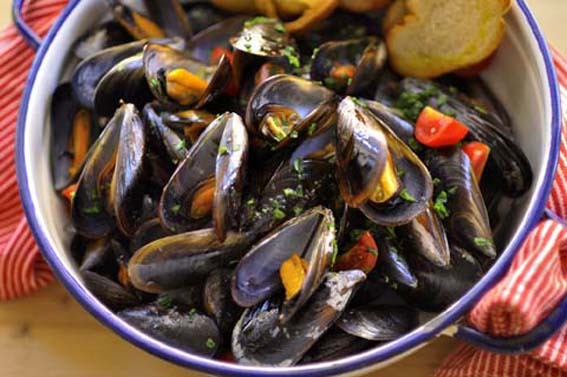 Australia has immaculate mussel growing areas in Tasmania and in Southern Victoria, even if Australians eat very few mussels compared to many Europeans, roughly 300 g a year compared to some Europeans (French, Italian, Croatian and others) eat over 1 kilo a year. The other bonus is that while they feel like an indulgent seafood experience Mussels don’t cost much. 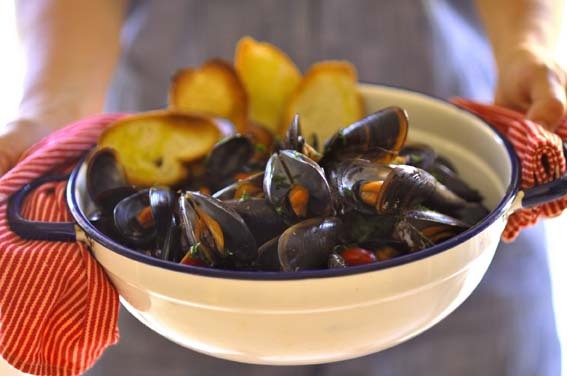 Here is a recipe for quickly cooked mussels with wine and garlic. Photos Leonardo Carosi. Serves 4 as a first course, serves 2 as a main. Clean mussels well and pull off beards by pulling down towards the pointy end of the mussel. Discard any mussels that are already open. Toast slices of day old bread and rub lightly with a half a clove of garlic and douse with a little olive oil. Wash, dry and roughly chop the parsley. Heat two tablespoons of olive oil in a large deep frypan or wok and add the squashed garlic cloves and chopped chili. Tip the cleaned mussels into the pan and add the white wine. Cover pan and cook for 3-4 minutes, tossing the mussels around a little until they have opened. Some mussels may be more obstinate than others in opening, those already open can be removed with a slotted spoon while the slow ones cook further. Remember that there is nothing wrong with the non-openers, they can be pried open and eaten, the mussels to avoid are those that are already open when they are purchased. Serve in large bowls with the cooking juices, a sprinkle of parsley and toasted bread crostini. To transform this dish into a pasta meal, add half a can of crushed tomatoes to the oil before the wine and mussels are added. 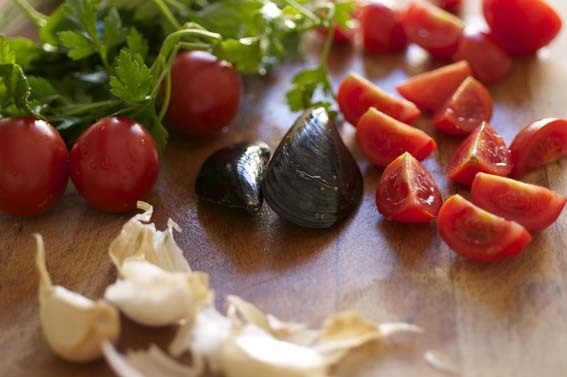 Cook spaghetti until al dente, drain and toss through the mussel sauce. It helps to discard some mussel shells before mixing sauce and pasta. Garnish with chopped parsley. I’ve still not been to Santa Marinella. We want a bit of beach when we visit Rome at the end of the month – perhaps here, or we might splash out and have a few nights on Ponza. Do love an island. 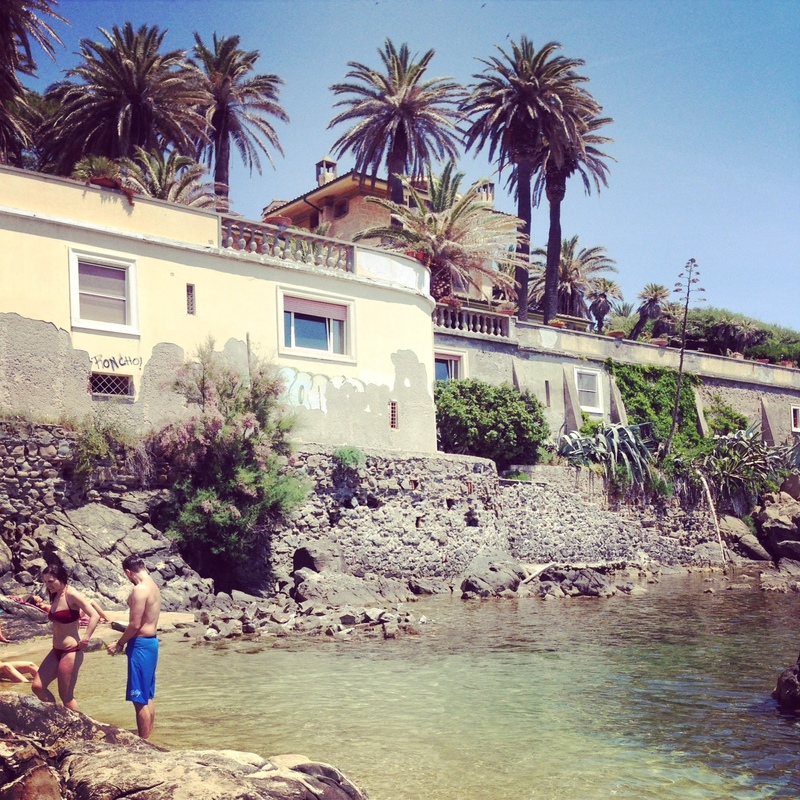 Santa Marinella is great for a day trip, nonostante the very scandalously small section of free beach…. If you have time for Ponza then do it! The northern part is the most chilled, even though in June everything is chilled in the med compared to July and August. Looking forward to seeing you and Fran.